It's rainy and dull here in Idaho as I'm writing this. As much as I love rain, the lack of a bit of sun is a bit discouraging. I really needed something soft, and pretty to cheer myself up. When I saw the catalog for the first time, there were three things that I knew for sure. #1 - the new Tin Pail Card Stock was going to be a favorite. #2 - I was completely ga-ga over the Copper and Rose gold items. And, #3 - the cement tile stencil was a MUST HAVE. For today's card, I applied Modeling Paste through the Cement Tile stencil onto Tin Pail Card Stock. I allowed that to dry, before trimming the edges slightly to take off the rough bumps that tend to happen when you use modeling paste on a surface that's slightly smaller than the stencil. You can scrape the sides off, but sometimes that leaves a thin streak along the edge, so I much prefer trimming the dried panel. 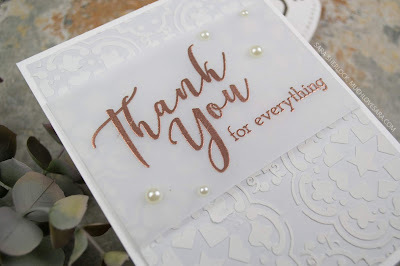 I stamped and heat embossed the Thank You and For Everything sentiments onto a panel of vellum, and wrapped that around the Tin Pail panel. Then I added a few pearls, and adhered the card front to a Whip Cream card base. Wow! Your card is absolutely gorgeous!